Late Night host is back on the road this weekend for stand-up dates in St. Louis and Minneapolis. 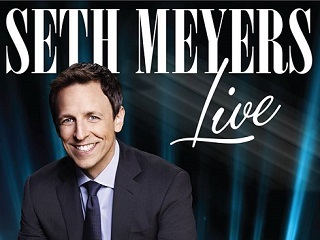 Somewhat more quietly, the Late Night host has been emulating Jay Leno’s celebrated work habit of jetting off on weekends to do stand-up. Formerly known as the Kiel Opera House, the Peabody was inaugurated in April 1934 with a two-week performance of Aida by members of The New York Metropolitan Opera. When Meyers steps on stage tonight, he will be following in the footsteps of not just Giovanni Martinelli and Elizabeth Rethberg but many others. Everyone from The Rat Pack to Emerson, Lake and Palmer. Lorry Wells Bunch (to a tagged John Bunch): This should be a date night/ owed birthday night / owed anniversary night. Corey Tisdale: Nobody wants to win those tickets… I’d rather see Stevie Wonder and Ray Charles fist fight.